Confident but let’s not get complacent. Check out the Round 25 Sydney Derby preview over on Sydney FC Unofficial, including a match preview and statistics. Can we recover in enough time from last night? Ninkovic and Brosque got a good rest and Retre may come in for Brillante so I’m not worried about that. The biggest issue would be if Zullo is out. NorWesters are better than earlier in the season,FC last few games have been quite good though. FC by 1,but i hope its a bigger margin. Perff to lose and make it a Plate game next round(even though they will still have it on GD)the Nix will beat them last round. Also hope it attracts a good crowd, to do the Quaddy over them would be nice. I have fixed my mistake. Anyways, they’re definitely better going forward with Duke & Yeboah upgrades on the other 17 wingers on their books. But they’re still dire at CM and fielding one of the worst back 4’s in HAL history. No excuses, Sydney by 3. We’re way too strong favourites for this to win it. Zullo out is also a big one. Whilst Retre probably gets shuffled there, I would mind seeing King get a go there at some point (though not sure if a derby or perth is a good op to bring in a kid). Or do you put Grant there and start Tratt on the right? Grant should play RB. He represents the country there so it would be a waste not to. I wonder if we would play Calver at LB. He played there briefly earlier this season right? I know Grant has always been pretty hopeless on the left, but I don’t think we should break up the CB pairing. Still, if you tell him not to ever cross or pass with his left foot, I don’t know who’d be better there than Grant… Maybe play Tratt on the left, if he’s ready to go? I was pleasantly surprised at how far forward Retre got from LB. Happy to keep him there as it’s probably less disruption to the system, with Caceres as the one to challenge Brillante. Forward options we are stacked with everyone fit, though surely ALF will need a rest before finals. Retre rarely kills it, but he can always be relied upon to do a solid job when he’s asked to slot in, in most roles he’s had. Basically, slotting in is his job, so let’s let him do it. He’ll have a strong, stable side around him so he’ll cope. Jop to left back. Strong enough to hold up Duke and Yeboah on the ground and in the air and has a killer left footed long pass. And with the experience to read the game. Zullo confirmed out with a hammy. Retre looked good when he got forward and cut inside. You will lose crossing but him overlapping and working with ninkovic and Alf would be dangerous. 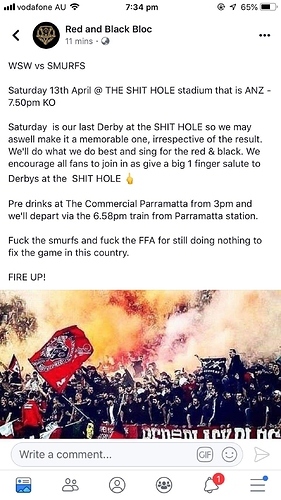 So after saying they would not be active for their remaining games at ANZ, the rbb are active for the derby. Wonder what their excuse will be when they don’t even have enough to fill a single bay?